Looking to stay close to the best sights in the Smokies? For vacations in the Smoky Mountains, our Pigeon Forge area cabins are an excellent choice! We offer hundreds of cabins in the mountains of Tennessee that are convenient to the best things to do and see. Whether you are looking for a secluded cabin in the mountains or a resort rental convenient for accessing the best attractions, you are sure to find it here. These comfortable cabin rentals near Pigeon Forge are bound to have the right amenities and location to make your trip a success! We also offer Smoky Mountain cabins in Gatlinburg that place guests close to Ober Ski Mountain and the national park. Our cabins near the Pigeon Forge Parkway offer a convenient location for experiencing a huge variety of local attractions! No matter if you are planning fun-filled days at Dollywood theme park, Ripley's Aquarium, or hiking in the national park, Cabins USA Gatlinburg offers an accommodation that's perfect for your vacation. We offer rentals that range from cozy 1 bedroom log cabins to 7 bedroom group lodges! This premium selection of vacation homes can suit every group and occasion. For couples planning a romantic trip in the Smoky Mountains, we offer honeymoon log cabins. For the perfect family vacation, there are also cabins for families close to Pigeon Forge. If you are looking for large group accommodations, there are Smoky Mountain group cabins that comfortably sleep up to 28 guests. Some of our other vacation homes include handicap accessible and pet friendly rentals. Our cabins are designed to meet a huge variety of vacation needs and occasions so that everyone can enjoy a comfortable stay in the Smokies! Once you find the perfect cabin for your stay in the Smoky Mountains area, remember that online bookings receive a 15% discount! These affordable cabin rentals near Pigeon Forge are even better budget vacations when you book with Cabins USA Gatlinburg! Prepare for making wonderful memories on your trip to the beautiful Smoky Mountains of Tennessee. "Angel Haven," a Mountain Park Resort Pigeon Forge TN cabin, offers gusts a 1-bedroom cabin rental with swimming pool access and WiFi Internet near downtown Pigeon Forge. Looking for a Pigeon Forge cabin in Mountain Park Resort in Pigeon Forge, TN, check out Cherished Memories for affordable cabin vacation fun in the Smokies! Get-R-Done Smoky Mountains honeymoon cabin rental in Mountain Park Resort. A romantic 1 bedroom cabin in the Smokies with swimming pool access. Welcome to "A Dream Come True," a vacation home in the Great Smoky Mountains of Tennessee! Enjoy a getaway with a hot tub, mountain view, and a special online discount. Welcome to Mountain Park Pigeon Forge where you'll enjoy "Autumn Ridge", a 2-bedroom cabin with swimming pool access and WiFi Internet at great rates. One of our Country Oaks cabins, "Serenity," provides guests with a comfortable cabin interior for rest and relaxation as well as fun and entertainment with friends and family on vacation. "A Creekside Retreat" is a lovely 2 bedroom cabin in Pigeon Forge with a creekside location, a game room, a hot tub, and room for up to 8 guests in the Smoky Mountains. "Rays Inn" is an affordable 2 bedroom cabin that's only 1.3 miles from Downtown Pigeon Forge with pool access, a hot tub, and our special cabin discount! Come stay at "Tin Pan Alley," your 2-bedroom cabin near Gatlinburg with theater room, hot tub, fireplace, and more! Catch the stars from your spectacular 3-bedroom cabin near Gatlinburg, TN with hot tub. Stay minutes from attractions and get immediate savings on your cabin! Enjoy an unforgettable vacation to a 3-bedroom cabin near Gatlinburg with a theater room, game room, hot tub, and more! Pet Friendly cabin in Pigeon Forge at Mountain Park Resort. Amazing Majestic Oaks is one of many fine pet friendly Tennessee cabins available at Cabins USA. "Lacey's Lodge" is a 3 bedroom cabin close to the Old Mill area of Pigeon Forge. Comes complete with hot tub, pool table, fireplace, and our cabin discount! Welcome to "Wolves Den," a lovely 3 bedroom cabin in the Smoky Mountains complete with a hot tub, jacuzzi, game room, and more! Book today & save! "Family Getaway", a Smoky Mountain vacation rental near Gatlinburg, sleeps up to 10 guests and offers swimming pool access and WiFi Internet in Mountain Park Resort. Take off to the Smoky Mountains and enjoy a stay at “Pappywood” a 3-bedroom cabin near Gatlinburg that places visitors close to top attractions, including The Island. Come escape to your home away from home at “My Pigeon Forge Retreat!” This comfortable condo offers guests three bedrooms, a deck that looks out on the Smoky Mountains, and plenty of resort amenities! Your Mountain Park Resort TN Pigeon Forge cabin rental, Bear Play, is a beautiful 4-bedroom Smoky Mountains cabin minutes from attractions and endless adventure! Come stay in style and luxury at one of cabins in the Smokies! Check out our 4 bedroom Smoky Mountains cabin "Cuddly Critters" less than a mile off the action-packed Pigeon Forge Parkway. 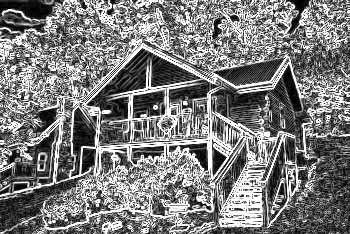 Welcome to our cabin resort near Gatlinburg, Mountain Park Resort, and Paws A While cabin with pool access, hot tub and more. Book Online Cabin Special! Searching for Smoky Mountains cabin rentals in Pigeon Forge Tennessee? Take a look at our 5 bedroom cabin with swimming pool access, WiFi and much more! Book "In The Heart Of Pigeon Forge" with Cabins USA Gatlinburg and you'll save 15% on this luxury 5 bedroom cabin that's less than 1 mile from Downtown! "A Mountain Lodge" comfortably sleeps 14 guests in a Smoky Mountain resort setting. Book your own cabin with a game room, hot tub, and a great location! Your Mountain Park Resort Pigeon Forge cabin, Bear Shack, is a beautiful 5 bedroom in Pigeon Forge less than a mile from attractions and endless adventure! Escape to one of our cabins in Pigeon Forge like "Cowboy Up" in Mountain Park Resort for an unforgettable vacation. Stay less than a mile off the Pigeon Forge Parkway and all its attractions! Enjoy a group cabin rental close to the parkway. "Lazy Days Lodge" sleeps 18 guests and has fun amenities like an arcade game and a pool table. Large group cabin rental by Cabins USA Gatlinburg. "Family Gathering" is a large, group cabin near Gatlinburg that sleeps 28 with resort pool and a hot tub.